I am Jayesh Adhyaru and you have stumbled upon my official blog, ’70 mm dreams.’ To be frank, to write about ‘who you are’ is too difficult to write. I, myself, am in search of the answer to this question. But it’s a bit easy to say what I have done so far. I was born in a hilly town named Junagadh, of Gujarat. Yes, the town of Narsinh Mehta, Asiatic Lions and Nawabs. I did graduation in science, tasted software engineering, civil services, masters in science (main subject Physics), but didn’t find peace of mind. I was never satisfied with anything. That thing inside me never allowed me to sleep peacefully. Finally one day, I realized, I love to write, share what I see, feel. To get close to write I came to Ahmedabad and got Masters degree in Journalism. I have worked with a small weekly magazine named ‘Aarpar’ and then worked with ‘Divya Bhaskar’ for more than eight years. In November 2014 I joined a Gujarati tabloid daily ‘Mid Day’ published from Mumbai. For more than three years, I worked for Mid Day. Besides writing millions of things for it, it was movie reviews I enjoyed the most. You can find all my reviews here on this blog. Then again I moved on from Mid Day to ‘DivyaBhaskar.com’. Currently, I am serving there as a deputy editor (features). Yes, I review more and more movies there as well. A few more things I discovered about myself are I am a passionate cinephile, a voracious reader, a traveler and a foodie. For the love of cinema, I did a ‘Film Appreciation Course’ in 2013 at ‘Film And Television Institute Of India’, Pune. 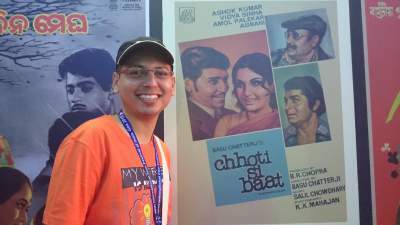 I attend ‘International Film Festival Of India’ (IFFI) at Goa almost every other year. Basically, I am like a child in a toy store who loves many things, who plays with many things. But I love to share everything with the world. Hence, this blog. Through my writing, I love to weave dreams, for me, for my readers. Hence, the name, ’70 mm dreams’. ’70 mm reels’ were the largest in size before digital projection era began. Welcome to blogger’s world sir! Nice to see you here.. Finally a place where I can find movie review from someone I love reading. ઉપ્સ . . તમે તો અહીં ઘણા સમયથી વર્ડપ્રેસ પર છો [ 2014ની જૂની પોસ્ટ્સ જોતા ખ્યાલ આવ્યો ] અને અમો અહિંયા વોર્મ વેલક્મની વાતો કરીએ છીએ 🙂 ક્ષમા વિરસ્ય ભૂષણમ. by writting movie review ,you are really doing best work for the cinema.